When I saw this necklace, I wanted to eat it like candy. Instead, I purchased it and wore it with this outfit... and at least three others that I didn't share. It was sunny and in the fifties yesterday, and it felt like paradise. Though cloudier, it's just as warm today. So, on that note, I'm going to head outside! This outfit is so definitely one of my favorites. The combination of the cardi and the necklace is so perfect, and I love that you paired it with jeans! So cute Katy! Makes me wish it wasn't finals week in my studio arts classes so I could get out of paint clothes and into something class and cute like this! That bubblegum necklace is scrumdiddlyumptious. I like how the bubbly necklace goes with the ripped jeans, nice contrast! Wow, I love this outfit. And I LOVE that necklace. You are right: yum, candy! That was my first thought! This outfit is perfect. Love the pop of pink from your necklace. so cute! is that an anthro necklace? drool, drool, drool. those shoes? oh my. i'm kinda wimpy when it comes to heels, but a platform or a wedge? i'm all over it. Oh I want that necklace, its gorgeous and looks wonderful with the leopard cardie. this is such a great outfit! 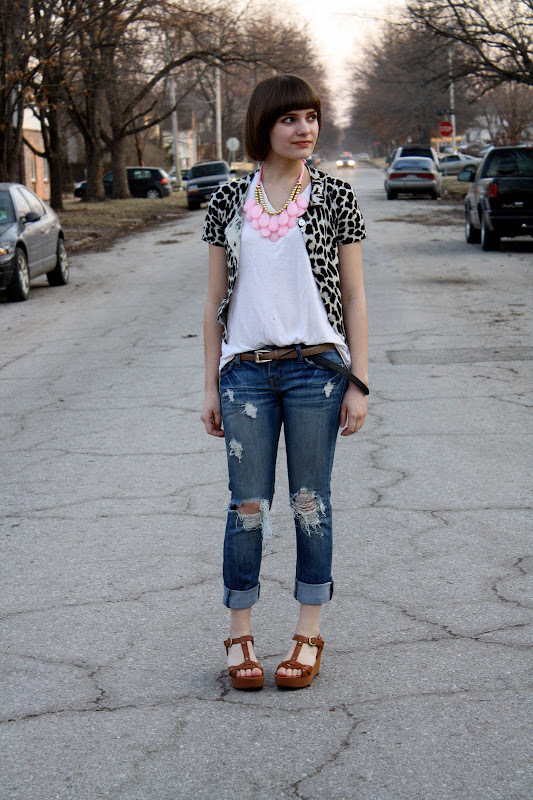 the styling is perfect with the white tee, ripped slouchy jeans, and the leopard jacket. and that necklace is to die for!! I love how effortless and chic this is! I absolutely love this outfit, and the fact that you busted out the sandals already, haha. I live in CT and saw some people sporting shorts this weekend already! you always find the best accessories! Super-cute necklace. You have such a good eye. i want to eat that necklace too. i love it paired with the leopard print. Yes, that does look positively edible. And Spring-y! I have one that could be your necklace's twin, but it's gray (and not nearly as delicious-looking!). I love how you styled it up! I absolutely love this ensemble, the little sweater is killer! super cute!!! love your hair cut too!